When a hardware hacker like myself faces a seemingly unsolvable mechanical problem – for example, when a gadget resists warranty-invalidating opening – you can typically find a solution on YouTube. And, if you need to use a less-than-intuitive program like GIMP, you will typically find an expert screencast on YouTube to help you solve complex problems, even as a newbie. 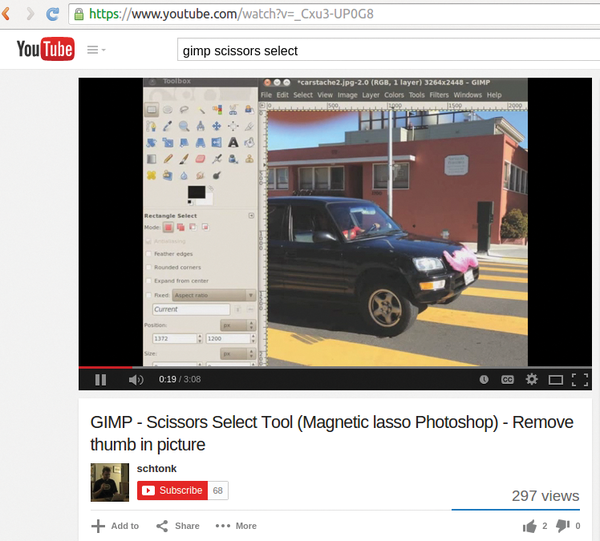 When I recently managed to use GIMP's Scissor Select tool successfully, I decided to create a screencast. Then, I waited for this masterpiece of movie magic to hit the charts on YouTube. I initially set monthly reminder dates in Evernote to check the number of views by hand at regular intervals. However, that got old pretty quickly, so thanks to the CPAN WebService::GData::YouTube module, I managed to fully automate the process. For this to happen, the YAML file in Listing 1 lists the IDs of the movies to monitor . I simply extracted the hex numbers from my videos' YouTube URLs. For example, the _Cxu3-UP0G8 string for the GIMP video was simply cut and pasted from the URL line in the browser displayed in Figure 1. Figure 1: The amateur director of this YouTube screencast would like to know how his viewer numbers are developing (297 views so far). The script in Listing 2 uses the CPAN YAML module to walk through the entries in the YAML file; it passes the movie ID to the get_video_by_id() method in the WebService::GData::YouTube package on every iteration. 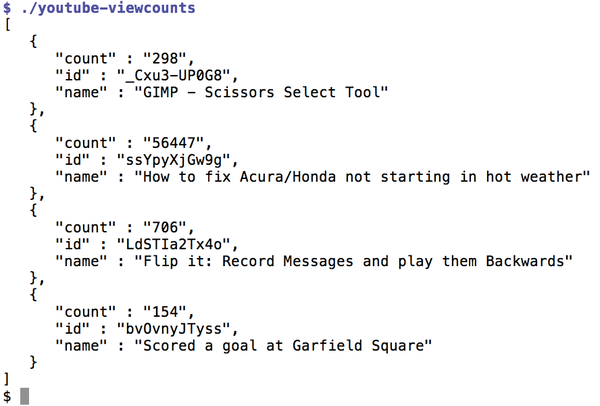 The method in turn contacts the YouTube API server and receives a mess of metadata about the movie. Below the _feed key, the script finds the yt$statistics entry with the value for ViewCount – you guessed it, the number of times the movie was requested by interested viewers. Lines 23 and 24 quickly convert the output, with some help from the CPAN JSON module, to a machine-readable format; this allows for easier post-processing by a script like Listing 3. They set the pretty option to make the output easier for human consumers to understand and canonical to sort the hash keys alphabetically, which would otherwise be in random order in Perl. In the resulting array (@result), each element contains the name (movie title), count (the view count added by line 17), and id (the unique YouTube ID of the movie). Figure 2 shows the output from the script and reveals that my previously little-known sideline as a car mechanic working on 20-year-old Honda engines is one of the highlights of my oeuvre with no fewer than 56,000 views, whereas the GIMP screencast has a miserly 297 views to date. Figure 2: The JSON output from Listing 2 with requests per movie as retrieved from YouTube. If you run Listing 1 once a day as a cronjob, the next logical thing to do is to archive and later evaluate the data. For this, Listing 3 employs a SQLite mini-database that stores its data in a single file but still supports SQL queries. to receive the JSON data generated by Listing 2 and create a database record for each array entry. The script fills the table's date field for each new entry in line 16 of Listing 3 with CURRENT_TIMESTAMP; SQLite replaces this in the database with the current date and time. This step gives you a database entry with a time stamp for each monitored movie and day, and you can easily retrieve the entries sorted by time. Based on the database entries shown in Figure 3, Listing 5 now tries to find out whether the viewer figures are continually increasing or possibly skyrocketing. In this case, I want the script to alert me. Figure 3: The script stores the daily view figures in the SQLite database. How do you define skyrocketing, though? For a movie with 30,000 views, which increases by about 10 views a day, these 10 hits don't mean much. However, if you have a less successful movie that remains undiscovered for a long time, and then suddenly has 10 views, you might like to be notified. Because I recently read an excellent book titled Machine Learning with R , which explains all kinds of statistical methods, I had the idea of determining unusual jumps in the viewing figures by means of linear regression . This involves the CPAN Statistics::LineFit module used by Listing 5 trying to make a straight line out of flatlining or continually increasing historic viewing figures (Figure 4). 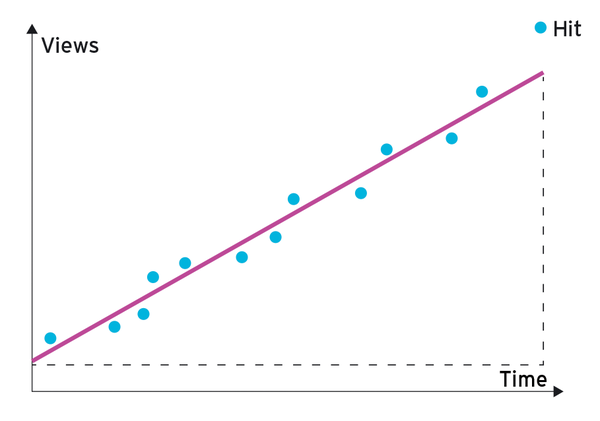 The x axis denotes time from left to right, and the y axis represents the number of views for the current measuring point. Figure 4: Listing 5 detects a hit if the latest value (blue dot on far right) exceeds the forecast value by far. It doesn't matter that the straight line doesn't hit each measuring point precisely (in fact, it's not even possible in most cases), as long as the linear regression keeps the unavoidable errors to a minimum. The problem was solved by scientists back in the dark ages, and the CPAN module simply implements the algorithm to compute the a and b parameters from the linear formula y = b+ax. The b parameter expresses the y value at the origin of the x axis (intercept), and the a parameter gives you the gradient of the linear approximation (slope).